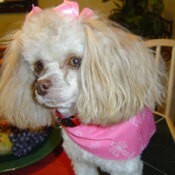 Crickett (Toy Poodle)Crickett is a Tiny Toy Poodle and is 5 years old. Crickett is an unusual poodle, she doesn't do a lot of yelping. She loves going for a car or motorcycle ride and just being with her family. She is our spoiled rotten baby girl. Flower Bed GliderWant something different for your flower garden or front yard? 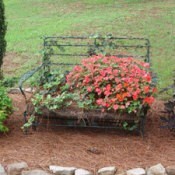 Use an old iron chair or glider, as I have used, to create a flower bed. I lined the bottom with coconut shell liners, filled with potting soil and planted away! Flower "Bed" That's DifferentWant something different for your front lawn or garden? Use an iron chair or glider and fill it with ivy and flowers. My husband put some wooden sides on it and I lined the bottom with coconut liners.